Tay-Bác is the name given to Vietnam's mountainous northwestern provinces. The area extends from Hanoi north along the Red River to the border of Yunnan Province, China and west of the river to the boundary of Phong Saly Province, Laos. The country's highest peaks lie in Tay-Bác. The valleys and slopes are home to an ethnic mosaic of some of the most colourful and traditional peoples in Southeast Asia. Yet in all of Tay-Bác only one major urban centre is up in the hills. The rest are plains towns, usually beside a river. The sole exception is Sapa, on the western edge of a high plateau (1650 metres) directly across the valley from Phansipan Mountain, at 3143 metres Vietnam's tallest. The town's location puts it in full view of some of the most attractive scenery in the country. Sapa is well-equipped with a full range of hotels, restaurants with bilingual menus (English and Vietnamese), souvenir and handicrafts shops, guides and tour offerings, jeeps and motorcycle taxis ready to take visitors anywhere in the district. Many tourists book their accommodation through Expedia. And if it all seems like a place set up primarily for tourists, that's because it was, a long time ago, by the French. French forces took control of northern Vietnam, then called Tonkin, in the 1880's. They spent their first few decades developing the port at Haiphong and the Red River route to Yunnan, hoping to make the new colony profitable. No one went up into the mountains to even take a look until a Jesuit missionary wandered into Sapa, then a Hmong village, in 1918. He judged it a good place to establish a church and a monastery. News of his discovery prompted others to go up and they were struck by the scenery and the refreshingly cooler temperatures. The mountains evoked memories of southeast France. The French dubbed them the Tonkinese Alps and from 1932 began developing Sapa as a resort for themselves. The church was already up, and a monastery had been constructed several kilometres away at Ta Phin. But from then on the buildings were all secular--villas, hotels, tennis courts, gardens, an aerodrome and a small hydroelectric power station by the waterfall in the valley just west of the town. To make room for themselves the French expelled the original Hmong inhabitants, who resettled in Sinchai, 5 km northwest. The resort grew until it held over 200 villas. Until a road was built connecting Sapa with Lao Cai, 40 km distant, French tourists had themselves carried up the mountain in sedan chairs. Sapa began losing its appeal during the war years of the 40's. The town still had more French residents than Vietnamese in 1945. But when the Viet Minh launched their armed independence struggle villa-owners and other civilians began to leave Sapa. Only a military unit was still hanging on in 1953, which led to Sapa's bombardment and subsequent total French evacuation. Only the Vietnamese remained. And they had only moved there under French rule and had now lost their main source of income and employment. Sapa's role shrank to being a simple township in the hills serving as an administrative and trade centre for the minorities in the area. Occasionally government officials visited Sapa on holiday, especially in the hot months of March and April. But not in numbers comparable to the French in their heyday. Most of the colonial-era buildings remained unoccupied and were anyway demolished in the brief but destructive Chinese invasion of 1979. Today only ten have survived more or less intact. In the early 90's the government opened Sapa to foreign tourists. By then economic reforms were in full swing and so local entrepreneurial types hastened to build hotels, restaurants and shops catering to the expected tourist trade. After all, Sapa's attraction as a destination hadn't altered since the French left. The mountains were still as majestic, the walks in the valley just as invigorating, the villages as old-fashioned as before, and the minorities all dressed in traditional costumes, as their grandparents were when the tourists were all French. The government has helped, too, by renovating the partly damaged church (but the blackened shell of the Ta Phin monastery was left standing as a war reminder), funding the park on Ham Rong Hill, and relaxing the restrictions of visits to the minority villages, which are yet enforced in other parts of Tay-Bác. Settlements of the Hmong, Dao (pronounced Zao) and Giay (pronounced Zai) are within easy walking distance. Tay and Xa Pho villages lie further south. Most hotels have their own guide service for those who want to trek for a few days and stay overnight in remote villages. The town itself is easily the prettiest in Tay-Bác. Its centre--the park between the church and the district administrative headquarters--lies about 2 km west of the highway. North of the central square hotels and other Franco-Vietnamese style buildings stand on the slopes below the woods. Just down the steps by the church is the covered market, plus the shops, restaurants and lodges of the original business quarter. Roads lead in either direction to the long valley between the town and the Phansipan range. Behind the square and the church stands Ham Rong Hill. Its park features flower and fruit gardens and orchid nurseries on the way up to its stony summit. Here great limestone boulders, dark grey with fluted sides and sometimes arresting shapes, jut out of the ground--Sapa's own little Stone Forest. To reach the lookout point requires twisting, stooping and wriggling through a group of these in the Cloud Yard near the summit. From here the view encompasses the Phansipan range to the west and other ranges and rolling hills to the east. For Vietnamese tourists a sunny afternoon on Ham Rong Hill will be the highlight of the visit, while for most Westerners it will be their encounter with the ethnic minorities. All types of visitors, however, can expect to dine well. Restaurants in Sapa serve dishes rare in the region, such as deer and antelope, steamed, fried or grilled. One place has "porcupine steamed in beer" on the menu, but it's seldom on hand, unlike the deer and antelope, which are available every day. Packed with protein, such dishes, along with pigeon and wild pig, amply fulfill the energy needs of those who would scramble up Ham Rong Hill or hike down to the waterfall and up the valley to Sinchai. Ordinary pork, chicken and beef can also be had, cooked Western-style or Vietnamese. Breakfast includes coffee and French-style baguettes, which are also on sale in the market, with paté. For alcoholic drinks, besides beer and whisky, restaurants and shops sell Sapa wine, made from apples. And a few places offer a stronger local speciality, called snake wine. Market day, when rural folk come to town to do their trade, falls every Saturday. The event is heavily publicised in Hanoi and several tour groups arrive all Friday. So do some of the Hmong and Dao women with their bags of goodies to sell to foreigners. They hawk used costume components and items made from them, like pullover shirts, pillow cases, bags, caps and purses. Much of it is actually made in Hanoi, shipped back to Sapa and marketed by the women on consignment. A few dozen such vendors operate in Sapa on the weekends, trying their luck with every foreigner they meet. Several of them, all selling basically the same thing, hang out at each restaurant entrance and peer inside through the windows. Whenever any diner glances their way a dozen or more hands spring into the air, holding aloft a pullover shirt, a cap, a pillow case. It's the only place in Tay-Bác where minority women are so aggressively commercial. The Hmong are the most numerous on market day. A few are from the Flowery Hmong branch, named after their lavish use of colour on their embroidered and appliquéd costumes. 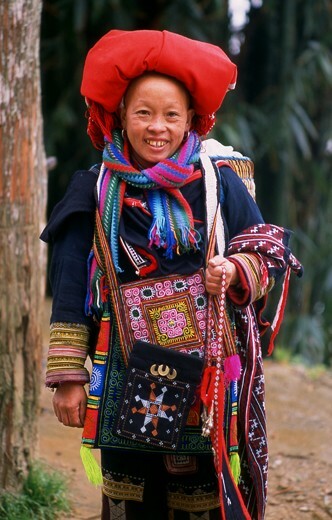 Like most Hmong branches the women wear the bulky, indigo, batik skirt, but the main branch in Sapa, comprising more than half the district's population, is the Black Hmong. Black dominates the costume, male and female, usually of hemp cloth, woven and dyed at home. Instead of skirts the females wear black, knee-length culottes, with leggings, a long-sleeved jacket, long vest, belt and tubular black silk hats, with the hair tied inside. The only colour is at the collar and sometimes the upper arms. They also wear huge round silver earrings, sometimes two or three pairs at a time, and thick silver neck-rings. Men wear long trousers and no headgear, but a similar jacket and vest, slit at the waist. Most Dao men also dress traditionally, with an indigo jacket trimmed in colour and a turban with embroidered ends. Dao women, though, don a much more eye-catching outfit, featuring an indigo coat with a long tail and heavily embroidered lower half. The lower parts of their trousers are also embroidered, as are the aprons and baby-harnesses. This branch is known as the Red Dao, after the elaborate red head-dresses women wear. These can be bulky turbans, embellished with silver chains and coin pendants (old French colonial quarter piastres) or tall tubular hats, wrapped in a scarf or festooned like the turbans with silver chains and coins. Minorities around Sapa don't just dress up on market day. They always wear their traditional clothes because they have a strong sense of ethnic identity. And in most cases they cannot afford to buy modern clothes, but to make them their only expenditures, besides the little cash needed for embroidery thread, are time and energy. Even while walking to the field or the market Hmong women twist hemp thread, wearing loops of it around their necks. Whenever Dao women are seated, whether in between chores or taking a break on a long walk, their hands are busy embroidering. Handicraft activity is most extensive in the dry winter months, when field work is minimal. Women sit in the sun on their porches to do their stitch work, while strips of freshly dyed cloth hang drying from poles in the yard. Villages average 30-40 one-story, wooden houses, with roofs of thatch or wood tiles. In the remoter areas slash-and-burn is the primary method of cultivation, but all along the valley southwest of Sapa Hmong and Giay villagers have constructed impressive terraces. Tay-Bác's minorities, unlike their ethnic cousins north of the border, did not suffer a Cultural Revolution or government assault on their customs and traditions. They have maintained good relations with the Vietnamese ever since they supported the Viet Minh in the early days of the independence struggle. Vietnam is a poor country and cannot spare much cash for development in Tay-Bác. Its minorities, therefore, still practise their traditional material way of life. Tourism has not undermined local culture. It has turned a small percentage of them business-minded, but it has also made them less shy of strangers, in contrast to minorities in other parts of Tay-Bác. Indeed, one could say they are quite used to foreigners by now. Twelve-year-old Hmong girls, all dressed in their black traditional clothes and big earrings, regularly greet foreigners with a smile and make small talk with them in three or four languages. A polite smile disarms the most aggressive Dao saleswoman, who will return it then and at every future encounter. Hotel bulletin boards are full of grateful messages from satisfied trekking clients, praising the warmth and hospitality of the villagers. With its scenery, exotic food and ethnic variety it is no wonder Sapa's revival is a success. Friendly, hospitable, cheerful and self-assured, the district's colourful residents guarantee the town's second run as a mountain resort will far outpace its first.